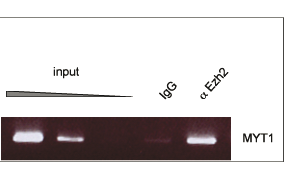 Figure 1 Western blot analysis using the Diagenode crude serum anti-EZH2. Western blot was performed using nuclear extracts from HeLa cells (HeLa NE, 20 μg) and the Diagenode crude serum directed against EZH2 (cat# CS-039-100) at dilution 1:1,000 in TBS-Tween + 5% skimmed milk. The antibody recognizes endogenous EZH2 in HeLa nuclear extract. On the right side, a molecular weight marker is shown (in kDa). The arrow indicates the location of the protein of interest. Figure 2. ChIP results obtained with the Diagenode purified antibody directed against EZH2. ChIP assays were performed using Jurkat cells (human peripheral blood leukemia T-cells), the polyclonal antibody directed against EZH2 (α Ezh2; Diagenode, cat# pAb-039-050) and the PCR primer set MYT1. IgG was used as negative control. Decreasing amounts of input were used for end-point PCR (lanes 1-3). The positive IP with the antibody anti-EZH2 gives a clear signal (lane 5), while the negative control gives no signal (lane 4). The figure shows the results for IgG purified antibody (2 μg/ChIP), however the crude serum (cat# CS-039-100) also works in ChIP at 5 μl/ChIP. Polycomb group (PcG) family members form multimeric protein complexes, which are involved in maintaining the transcriptional repressive state of genes over successive cell generations [1,2]. EZH2 associates with the embryonic ectoderm development protein (Eed), the VAV1 oncoprotein, and the X-linked nuclear protein. EZH2 may play a role in the hematopoietic and central nervous systems (NCBI GeneID: 2146: http://www.ncbi.nlm.nih.gov/entrez/query.fcgi?db=gene&cmd=Retrieve&dopt=full_report&list_uids=2146). Over-expression of EZH2 is observed during advanced stages of prostate cancer  and breast cancer . Diagenode strongly recommends using this:	EZH2 polyclonal antibody - Classic (Diagenode Cat# C15310039 Lot# 001). Click here to copy to clipboard. ESCs require PRC2 to direct the successful reprogramming of differentiated cells toward pluripotency.